Longboarding is becoming more and more popular amongst people of all ages. Whether you want a longboard for cruising or downhill rides, and whether you are a beginner or an expert, there is a board for you. But there is such a huge variety of longboards out there that it can be tough to pick one. With cruisers, freestyle boards, downhill boards, and more, each board offers pros and cons for your individual wants and needs. We know longboards, so we are going to take you through some of the top longboards on the market. Let’s get something straight: there is no one board that is going to be the best for everyone. On this list of top boards, we are going to go through each of the boards’ strengths and weaknesses. Consider what your needs are and what your experience level is. A top board for us might not be the perfect board for you. We have tons of reviews on different longboards for you to look through if these options don’t pique your interest. We thought we would start off our list with an all around great board that would suit both beginner and advanced riders. The Quest Super Cruiser is extremely popular, and for good reason. The high-quality materials (bamboo and maple) make this board durable and strong. The trucks are sturdy, and they are positioned so that you can get great turns and carving while still having the experience of a cruiser. The strength and sturdiness of this board comes with a price: it’s heavy, and it’s not super flexible. If you are going to use the board to get around all the time, it might be a pain to carry at a weight of around 8 pounds. However, it’s sturdy nature means that riders of all shapes and sizes can use it comfortably. It isn’t so inflexible that you can’t do tricks and turns, and it can be used by everyone from professionals and commuters. This is an all around great board with many applications for all sorts of rider needs. This 41-inch board is slightly smaller than the 44 inch Quest Cruiser, but that size difference doesn’t mean a difference in quality. As with the Quest board, the Atom can accommodate people of many experience levels. Its large, sturdy, and stable deck makes the ride easy and comfortable. 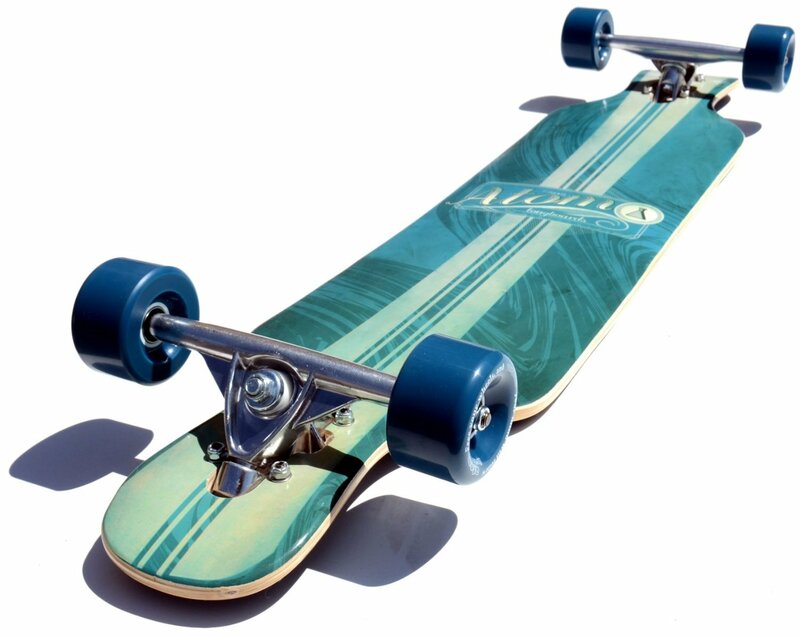 The drop-through style allows the wheels to be mounted differently than with other types of boards. This makes the ride lower to the ground, giving great maneuverability and stability. You’ll be able to get a good amount of speed while also being in control of the board. 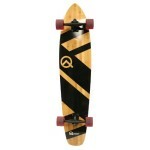 This is a board that looks great and is fun to ride as a cruiser and as a downhill carver. Its affordable price is also a great plus. One downside people have noted is the bearings. Some found that using lube helped increase the speed, while other people just switched them out entirely. Overall, this board provides a comfortable, sturdy ride whether you are hitting some sharp, intense turns or you are taking a quick cruise down the sidewalk. We have included this Penny brand board for some nice variety from classic longboards. Instead of a wooden deck, this board is made out of a special type of plastic, which gives it a flexible and durable foundation. It is designed on the top to give you a good grip without grip tape. The large wheels give you stability and safety over pebbles and cracks, while also allowing you to get a decent amount of speed. 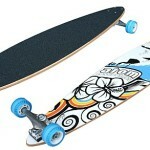 It isn’t horribly heavy, it’s shorter in length than most longboards (at 36 inches), and it has a cool retro style. All that being said, this board is likely best suited for people who aren’t riding super long distances, younger riders, and beginners. It would also be good for people using it as a transition before getting into bigger boards. This board is also affordable, which would be another plus to beginners who aren’t looking to drop 300 dollars on their first board. This is another drop-through style board similar to the Atom drop-through that appeared earlier on this list. A key difference though is the material of the board. The Atom is made of maple, while this Sector 9 board is made of bamboo. The maple in the Atom makes it extremely durable and sturdy, but the bamboo in this board gives it a nice springy flexibility. The bamboo adds this flexibility to a lightweight board without sacrificing toughness and stability. The flexibility makes this a prime option for beginner to intermediate riders who want to cruise more easily. However, this board can also be great for freeriding, carving, and even some downhill bombs if you switch out the soft wheels for some harder ones. This board is super stable, made of high-quality materials, and is manufactured by a trustworthy and well-known company. All of these great qualities do increase the price of this board compared to the others we’ve listed. But if you have some experience and want to invest in a great board, this is an excellent choice. Longboarding has been around for a while, and the boards continue to get better and better as the sport grows in popularity. Even though we have outlined some great options for you with this list, these are by no means the only great longboards out there. We tried to give you a good variety of boards that could fit your needs. Whether you are a beginner who wants their first board, or an advanced rider looking to upgrade, we hope this list could help. We are constantly reviewing and learning about all the new boards, brands, and gear on the market. If you have any questions, contact us and we can help you.